Last night I spent some time reading through Amazon and some other sites for good books about knitting. It's fascinating to me how much you can knit and knit and only learn what you need for the one project, never seeing the potential in other techniques because they're in some other pattern you're not making. It's sort of like the way you can live life quite adequately without ever traveling, but seeing how other people manage gives you more opportunities to live life well... if only to enjoy what you do with a different kind of tea on the table in front of you. All of which is to say that I now have a few more guides on my to-get list. And I am also going to try out the notion of knitting a circular garment on straight needles using the double knitting method, as somebody suggested on one of the sites I stumbled across. It's not like I don't have half a dozen pairs of 6mm straights looking for something to do, right? 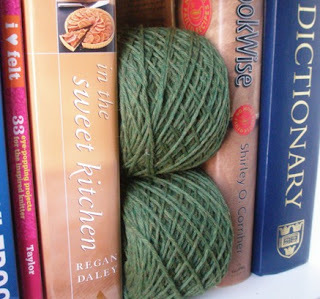 I love knitting books, and would buy them all if I could afford to. I will never learn everything there is to know about knitting, even if I knit every day for the rest of my life (which I probably will). I have no desire to scramble my brain with double knitting myself, but watching from a safe distance will be fascinating.